The efficacy of preemptive analgesia for prevention of phantom limb pain has been controversial although pain management before amputation is empirically important. The aim of this study was to determine the associated factors with perioperative phantom limb pain. Following approval by the Medical Ethics Committee in our university, medical records of patients receiving limb amputation surgery in our hospital between April 1, 2013 and October 31, 2017 were retrospectively reviewed. To determine which pre-operative factors could affect the development of phantom limb pain, we performed univariate analysis to find candidate factors (p < 0.05), and then did multivariate regression analysis. Incidence of phantom limb pain was 50% (22/44). 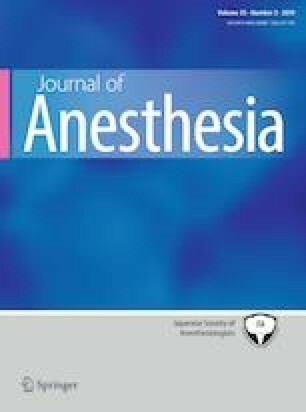 There was no difference between the groups in types of anesthesia and post-operative pain levels. The multivariate logistic regression including possible confounders suggested that diabetes mellitus and uncontrollable preoperative pain with non-steroidal anti-inflammatory drugs (NSAIDs) were independently associated with the development of phantom limb pain (Adjusted odds ratio (OR) 0.238 [95% confidential interval (CI) 0.0643–0.883], p = 0.032, Adjusted OR 6.360 [95% CI 1.280–31.50], p = 0.024, respectively). The types of anesthesia and the degree of postoperative pain were not related to the development of phantom limb pain. The present data suggest that insufficient preoperative pain with NSAIDs and diabetes mellitus would give an impact on the development of phantom limb pain. SN designed the study, analyzed and interpreted the data, and drafted the manuscript. JS reviewed the analysis of the data and edited the manuscript. KN helped conduct the study. MK and KH made substantial contributions to the conception and design of the study, helped in writing the manuscript, and statistical analysis. All authors have read and approved the final manuscript.